'Clotho's Web' (Anton Mego, R. 2009). Seedling AM-02/1000-2. TB, 35" (88 cm), Midseason bloom. Standards blue lightly stitched white at base; style arms blue; Falls from beards 2/3 blue overlaid with white veins, remaining petal blue purple, edges irregularly marked with light white commas; beards cream base, hairs tipped light orange, white at end; wavy; slight sweet fragrance. 'World Premier' X AM-00/0559-9: (AM-93/0312: ('Twilight Blaze' x 'Night Attack') x 'Slovak Prince'). International 2010. 3rd Prize Franciris® 2015. 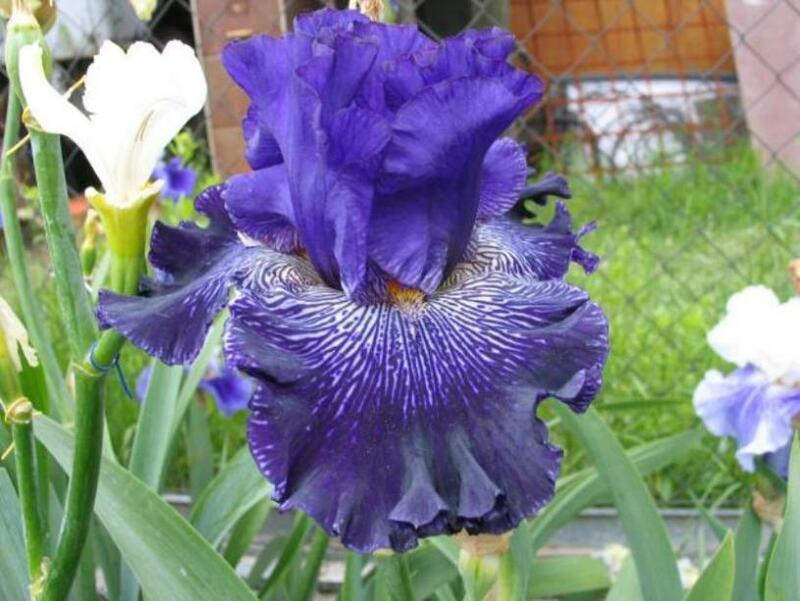 Hybridizer's Comment: Unusual web pattern, another fine descendant of 'Slovak Prince'.